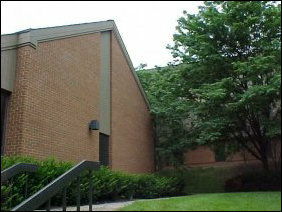 McGraw-Long Hall is on a well-landscaped hill in a quiet part of campus near the University Center. 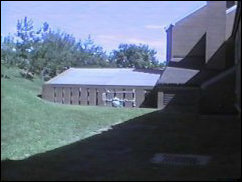 In this photo, you can see a bit of the shrubbery and plant life that surrounds the hall, as well as the McGraw-Long Hall sign. 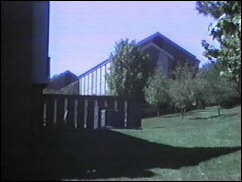 Around the front of the hall, we also have lots of trees. 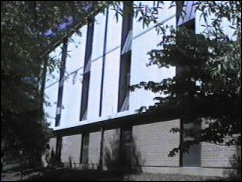 These trees provide for some shade for many of the residents on the front of the building, and allow for a pleasant place to study outside when the weather is nice. 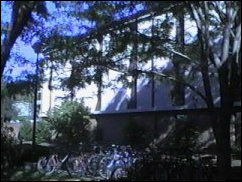 The shade provided by the trees surrounding us continues on the far end of the hall, housing the “C” section halls. 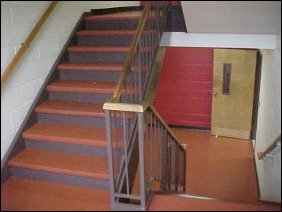 These stairs provide convenient access to the front doors from the “J” parking lot. 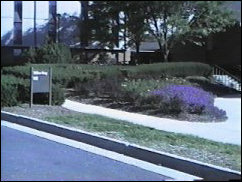 To the right is the outside of the TV lounge. 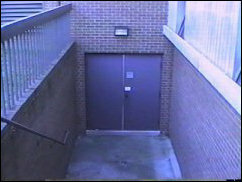 This is the view off of the outside stairwell, outside of the A-section halls. This was taken from the landing between section 2A and 3A. 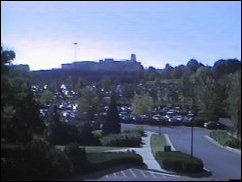 In the distance, going back from the hall, is J-Lot, then X-Lot, and then in the far distance, the CISAT campus. 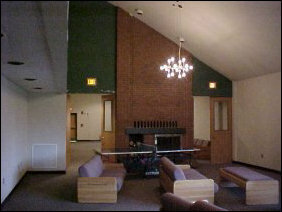 A typical hall in McGraw-Long Hall. This particular hall is 1A. 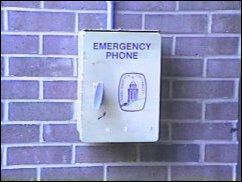 The second door on your right (with the fire extinguisher just inside) is the laundry room. 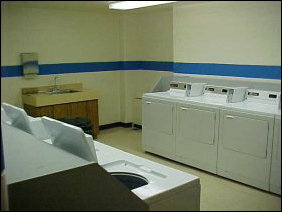 And speaking of the laundry room, here it is! Looking back towards the back wall, we find that the washers and dryers are in perfect order, as is the rest of the room. A group enjoys a midnight snack in the kitchen, also off of 1A. Speaking of the lobby, here it is in part. The door straight ahead leads to section 1A, and the windows to the right look into the hall office, where the Resident Advisor on duty can be found when they’re not on a duty tour. 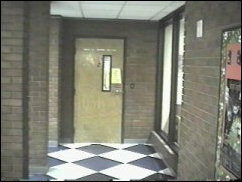 And here is a close-up of that hall office. Here, you can find the Resident Advisor that’s currently on duty, as well as check out various items such as ping-pong balls and paddles, as well as vacuum cleaners and other “cleanliness” supplies. This room, adjoining the TV lounge, is our game room. 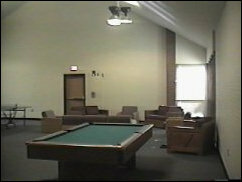 Here, there is pool and ping-pong to be played, as well as an area for interacting socially or conducting meetings. 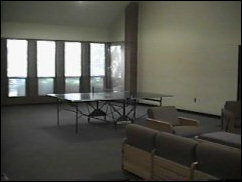 This is more of the game room, specifically of the area where the ping-pong table is properly supposed to reside. 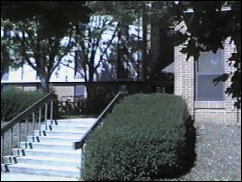 And, finally, who can forget this plaque that says this building was built in 1985, and named after two people – Walter McGraw, and Nellie Long. 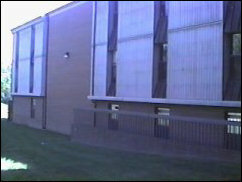 This is the back of the “A” section wing. 1A is completely underground on this side, and 2A and 3A are peeking out from above the ground. The 2A stair landing and the ground are roughly level. However, there is a considerable chasm between the two. This is a shot looking down McGraw-Long hall from the sidewalk leading to the far end of our nearest neighbor, Bell Hall. 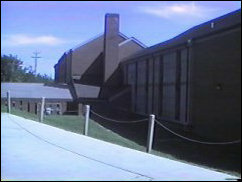 In the background is the “B” section of McGraw-Long, and the HVAC system housing in the rear of the building. 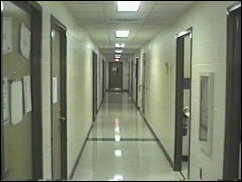 And this is where all the BAD residents are kept… just kidding. Seriously, this area off to the back and down below is where all the HVAC equipment is housed. 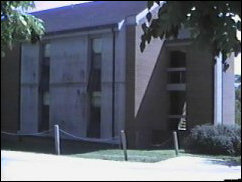 This is the back of the C-section of McGraw-Long Hall. Notice the area that’s straight brick all the way up. The restrooms are on the other side of this wall. 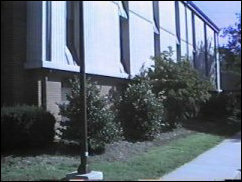 A look back past the HVAC units towards our nearest neighbor, Bell Hall. 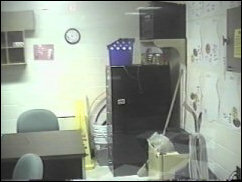 And finally, a view of the back side of the game room. This is technically in the front of the hall, but it’s on the side that most (save for front-side residents of C-section) don’t see.